The Rainfall was very heavy, as seen from amounts sent by Pradeep John and available on his Page. Besides, Abhijit has put some amounts of today's rainfall in the comments also. Besides, very heavy rainfall of 201 mms in Allahbad and 89 mms in Jhansi and 59 in Varanasi, was the effect of BB-14 floating Northwards. Delhi was cool and cloudy with the day's high of 26c being at 8c below normal at Palam and S'Jung. But several spots like Lodhi Road, University and Ayanagar were at 25c. Faridabad too was 25c. Delhi NCR may just get the shower in pats on Sunday 6th. Rainfall decreasing from Monday. Some models show the UAC from central axis spilling some rains in Delhi and North MP areas from later next week. But it depends on the UAC position and stregnth, so we will monitor the system after it forms. Otherwise, call for withdrawal ! *BB-14,now in the foothills, will create a mini "break Monsoon" in central India and interior peninsula. But only till Tuesday 8th. The axis on Tuesday "frees itself" and moves into the central India area, in the Gujarat/MP/Chattisgarh line. But, it is very possible that an UAC may form in the axis in the Southern MP region by Tuesday or Wednesday. Hence, after subdued rainfall in the NW and Central India and interor peninsula on Sunday /Monday, rains increase in MP and North interior Maharashtra again from Tuesday. Surat and Bharuch, wait for the UAC in Central India to form, and get the rainfall increasing from Tuesday 8th and Wednesday 9th. 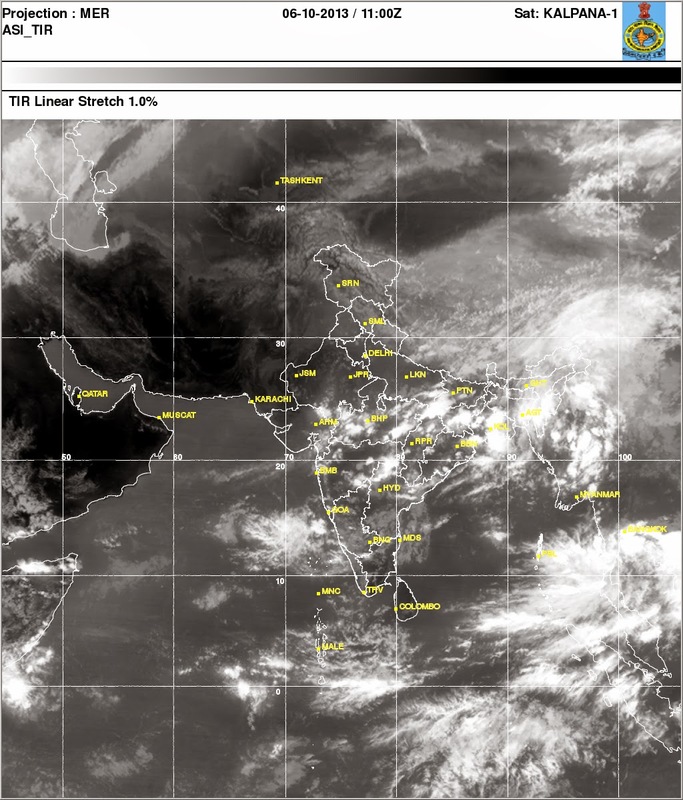 A low pressure forms in the Andaman region by Monday, 7th October. Seeing the present winds and upper jet streams, i would expect the system to track NW towards the AP/Odisha coast. Should be at least of Depression strength on reaching the coast by the 13/14th October. The west coast trough weakening after the UAC has crossed the Goa coast, should spell well for Chennai. City may see an increase in its thunder showers activity from Tuesday and continue in the week. However, the winds would remain W/SW. We will wait for the axis to slide down and track the outcome of the low/depression coming next week to determine the date of the NEM. Generally set in not before 19th/20th at least. Mumbai will be warm and partly cloudy with sunny spells on Sunday. Thunder developments possible in some parts. Northern and Eastern outer townships can get a thunder shower. Monday and Tuesday will see mild thunder showers in parts of city in the evening. Heavier showers in Northern and Eastern outer townships. Pune may get the thundery developments on Sunday/Monday/Tuesday with the thunder shower in some parts by evening. As we anticipate an UAC in Central India, Monsoon remains in Mumbai/Pune throughout next week. And oh yes ! Kolkata, just continue with your Thunder showers popping up in parts of city, some severe till Wednesday at least ! Very detailed and specific account of the Goa SWM season here on Weather in Goa blog. Karachi has been hot and sizzlng at 40c. Though Saturday and Sunday may see some relief of a few degrees, the North winds will bring very hot conditions to Karachi next week again. For Kathmandu, October has started of rainy and cool. With 17 mms already measured, the capital has next week too, for thunder showers are expected to form for the next 4/5 days at least. Nights will be around 16/17c though. Neeraj will tell us of the latest. Non stop heavy rains indeed in Goa since Friday evening. June - July like weather. Feel pity for all the tourists, specially those riding hired two wheelers! Only if they knew about the approaching UAC! Rains recorded at Panaji till 5:30 am today 56 mm and continuing. No rains in mumbai both on thursday and friday..
Thursday thunderstorm rains were only in Vasai and surrounding areas like Nala Sopara and Virar, but mumbai was left out.As Mumbai's rains are very unpredictable most of the time, when the rains might turn up in Mumbai . @ Sam . Yes. Mumbai is very unlucky since Aug itself. Aug & Sept saw almost 50% deficit than normal. Mumbai is just getting extended monsoon days instead of an rainy days.. Rest India like Vidarbha, Gujarat, N India like Agra ,UP & NCR region getting some rain also with delayed withdrwal. Now S.Konkan & Goa having heavy rains.. While of BB 13 it rained heavily from Palghar onward to North side in Guj & now UAC of ARB giving rain from Roha, Pune to South side.. So Mumbai is missed by both systems !! Lets hope today atleast some rain comes in Mumbai.. Wow!! Break Monsoon like scenario on 5th October! Which means there is more rain to come for North India from SWM. Amazing. We got some rain in malad goregaon for around 20 min..with mild thundering..
oh no waiting for NEM to commence..keeping my fingers crossed on the onset.. Very heavy thunderstorm in Vasai,for 30 mins , now raining moderately. Another 1 hour of heavy rains in Vasai. altogether Vasai received very good rain's.light rain still going on. Looks like North east monsoon will have some effect , because of stubborn behaviour of south west monsoon 'withdrawal definately delayed this year, also the UAC formation one after the other, will not allow the monsoon to withdraw, atleast not before next week is out. Badlapur had very heavy rain for 1hr period. And then lightning & thundering after the rain. Wishing all Vagarians A Very "HAPPY NAVRATRI" !! the start of oct has been cool and rainy - more rains than generally expected for this time of the year. Still under the effect of monsoon, hence its been rainy, and day time max has been below normal but also - night time low has been above normal for the same reason. i'll wait and see what happens in the next few days. will report again then. The Bay Depression you expecting on around 15th will strengthen west coast through? It's the time for fog season in Badlapur.. As today Dense Fog has engulf Badlapur with visibility reduced to less than 300 meters !! Looking at the dense dark clouds in the morning, it looked 'as though' it will pour, but Vasai got light rain for 30 mins comming in from the west.weather has turned very pleasant. but still covered with clouds. Another thunderstorm is getting ready here at Vasai, could be isolated thunderstorm or widespread it has turned dark in the eastern sky. Had a torrential showers in dombivli at 1:30 pm with gusty winds & with Thundering n Lightning.It lasted for 30 mins and then followed by light showers. I was completely wet & commuters were caught surprise by this Sudden heavy downpour & gusty wind. yup.Vinod & nimish...the CB clouds developed in thane & then intensified and travelled SE & gave out a torrential rains in Dombivli-Ulhasnagar.Thane got 0.5 mm only as per envirocon. Dry thunderstorm passed over Vasai, with no rain at all.weather is dark n gloomy. @khyati ,Now heavy rain's started in Vasai. @khyati plz do not call me sir,call me sam,the only sir we have on this blog is Rajesh sir' from whom we learn about weather .thanks. Badlapur dense foggy ,cool with clear sky. @ Abhijit Supprised no rains in badlapur. It rained very heavily here in malad this morning for about 40 min. @ Sam. Yes. As per sat image & radar only coastal line from Daman, Dahanu to N.Mumbai was having rain after midnight to morning period. We at inland where having clear from last night itself so was cool with dense fog with visibility just 500meters today. Yesterday it was just 300meters here in Badlapur..
Rajesh, sir why do the thunderstorms that form in the afternoons are dissipating whereas the morning storms are getting heavier.whats the cause behind it? some moderate shower after long wait !! Weather has turned worst very humid after the rains.will there be a thunderstorm later on ...? Monsoon average for kathmandu is 105 days according to our met dept, this year its already 115 days and monsoon is yet to withdraw. Probably 8 to 10 days more for it to withdraw completely, what say rajesh sir ? or is it going to linger for more? Tomorrow also , the coastal strip of north Maharashtra might get good rains.